Streetsville Animal Hospital utilizes some of the most advanced imaging techniques available. With on site Radiology, Ultrasound, and Endoscopy, you can feel secure in the knowledge that your pet will receive the best treatment available if required. X-rays can be used to evaluate almost any organ in the body. They can also be used to assess the condition of the bones and joints. X-rays are commonly recommended in certain situations including vomiting animals, lameness evaluations, coughing, evaluations of heart murmurs, and several more. 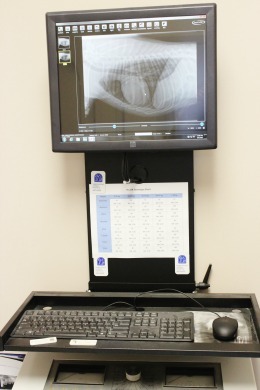 Streetsville Animal Hospital uses digital X-ray equipment which means faster and often more detailed imaging results. X-rays are by their nature open to interpretation. A diagnosis is dependent on a quality x-ray and the experience of the veterinarian to properly interpret the image. Dr. Todd has years of experience taking and interpreting x-rays. You can trust his ability to help your pet if x-rays are recommended for your pet. If necessary, we can have a radiologist specialist interpret results as well. Diagnostic ultrasound uses sound waves to produce a real-time imaging of your pet’s internal organs. It is a fairly specialized technology that requires a commitment on the part of the operator to make the most of its abilities. As with x-rays, the ultrasound images have to be interpreted, requiring skill and experience. Ultrasound can be done on the chest to evaluate the heart, lungs, and masses. It can also be used to evaluate all of the abdominal organs. It provides different information that x-rays, and is preferred in certain situations. 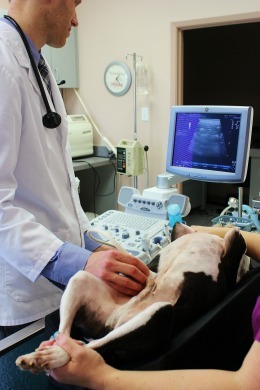 We perform our own ultrasounds at Streetsville Animal Hospital, utilizing the services of a specialist when required to assist in the interpretation of the collected images and videos. We have four different endoscopes at Streetsville Animal Hospital. They are used to provide various diagnostic and therapeutic treatments. Our flexible fiberoptic scope is used to image the intestinal tract from within. Upper gastrointestinal scoping allows us to evaluate the esophagus, stomch, and first part of the small intestine. We commonly use this to evaluate causes for regurgitation and vomiting, to remove foreign bodies from these areas without the need for surgery, and to obtain biopsies for the evaluation of inflammatory disease and cancer of the stomach and intestine. We can also use the scope to evaluate to large intestine. It is common for animals to develop chronic inflammatory disease of the colon that can be diagnosed with a biopsy obtained through the scope, again eliminating the need for surgery to make a diagnosis. 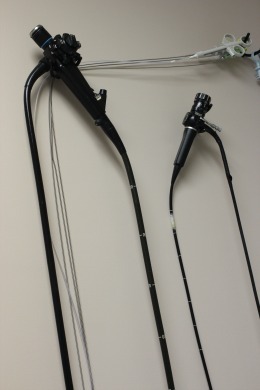 We have a smaller flexible fiberoptic bronchoscope that we use to evaluate the upper and lower airways. Pets with chronic respiratory problems are best assessed by directly looking at the airways. Our scope is small enough to assess all but the tinyest patients. The information and samples we collect during bronchoscopy are invaluable in helping diagnose and treat our patients. Our rigid arthroscope can be used to assess various ailments in dogs and cats. We can evaluate certain joint problems with our scope. It is also used to evaluate nasal disease without the need for surgery. Many times, problems that in the past have required aggressive surgery, can be diagnosed and treated through the arthroscope with a minimum of hospitalizatoon and post operative pain. Our newest modality for treating severe ear infections is our video otoscope. This short rigid scope allows us to thoroughly evaluate the ear canal of a dog or cat. Unlike the handheld otoscpes used in the exam room, the video otoscope produces an image on a screen that is magnified and much easier to see and interpret. An unfortunate consequence of chronic ear infections is an infection that extends into the middle ear. The video scope allows us to make the diagnosis of a middle ear infection and also allows us to flush the middle ear, eliminating the need for an aggressive, expensive, and painful surgery in a large number of cases. Dr. Todd is committed to providing the most efficient and effective treatment for your pets. He constantly upgrades his skills so he can provide your pets with treatment options like those listed above. Contact us to request a future appointment. Both new and current patients are welcome.